“The right tactic for us is to be visibly and always what we are, nothing more, nothing less. We defend a citadel which cannot be taken except when the garrison itself brings in the enemy. Combating with our own arms, we only receive minor wounds. All borrowed armor troubles us and often chokes us.” (L.Veuillot, Mélanges, Oeuvres completes, iii series, 1933, v, 276). The 2012-2013 Roman Forum Church History series in New York City covers the years from 1517-1563, a time both of terrible crisis in the life of Christendom as well as one of extraordinary hope for the future. Extending from the emergence of Martin Luther onto the public scene until the end of the Council of Trent, these forty-six years placed enormous burdens on the faith of the Christian population, repeatedly arousing profound sorrow and rage in its ranks. Think, for a moment, of the life of a fervent, believing Catholic just reaching manhood in 1517. Such a man would have been in his mid sixties when the last acts of Trent were promulgated. In the interim, he would have seen an immoral, indifferent, politically obsessed, secularized, intellectually and spiritually clueless clergy and laity allow the Bride of Christ to be brutally lacerated and piteously mocked. He would have witnessed the seemingly irresistible spread of a heresy which proclaimed God’s world to be nothing other than a realm of total depravity wherein a war of all against all guaranteed the Triumph of the Will; a heresy whose consequences were so horrible that its Protestant proponents--- often much better men in practice than their ideas would logically allow them to be---immediately began a sophistic, many-headed, and impossible effort to escape from them. Even in 1563, our tired believer, his patience repeatedly tried, his hopes regularly thwarted by foolish men with blinders fixed upon their eyes, might not have foreseen what glorious fruit would come from a Council that recognized that only the deepest concern for doctrinal orthodoxy could prevent heretical minds and spirits from twisting the most brilliant pastoral reforms to their own anti-Catholic purposes. Even then, our aging warrior might not have digested the tremendous significance of the worldwide spread of Catholicism that new and reinvigorated religious orders were rapidly bringing into being. Gloom might still have hovered over his long troubled soul. It is impossible to enumerate all the twists and turns making those terrible decades almost unbearable for a faithful son of the Church, but one that is both poignant---and for me, personally, all too directly related to our contemporary sorrows---well illustrates the anguish and disappointments of our believing ancestors. This concerns Marcello Cervini (1501-1555) Pope Marcellus II, whom most of us perhaps know only indirectly through Palestrina’s magnificent Missa Papae Marcelli. Virtuous, learned, and humble, Cervini was one of the three legates sent by Pope Paul III to preside over the Council of Trent, the first of whose three distinct sittings began in December of 1545. Not only did this highly trying legatine labor complete Cervini’s already formidable knowledge of the reality, the complexity, and the necessity for tackling the seemingly mortal wounds of the Church; it also contributed mightily to his growth in personal sanctity. I dare say that few of us could have responded to the trials of his position with the same combination of commitment to Catholic doctrine and Catholic charity. So obvious was it that Cervini was the “right man at the right time” that the cardinals meeting in Conclave in April of 1555 upon the death of Pope Julius III, even those representative of political forces that normally would have opposed him, crushed the ambitions of one of their powerful self-interested colleagues and proceeded immediately to his election. Keeping his own given name, Marcellus II’s accession to the See of Peter was greeted by all who cherished the defense of the Faith and sought the purgation of the human evils marring the beauty of the Bride of Christ with the greatest joy---indeed, as a manifestation of the direct intervention of the Holy Spirit. His first actions confirmed all of their expectations. Nevertheless, within twenty-three days Marcellus had a stroke and was dead. The vultures hovering over the suffering Church rejoiced. Another chance had been given to them to pick at the remains of her still half-dead body---from within as well as without her official structures. 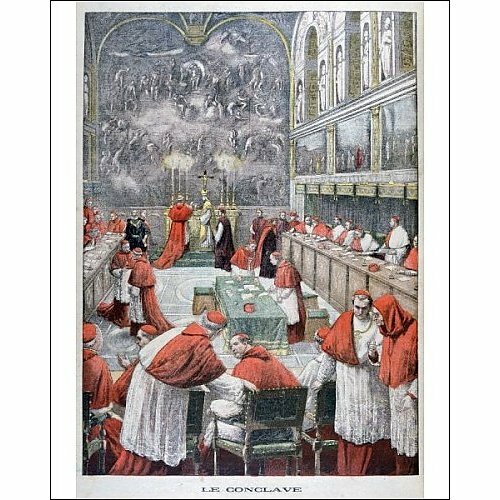 No one quite knew who would follow him, given the division of the College of Cardinals into strong factions whose solidity might well presage a Conclave damaging for its length as well as for its outcome. Instead, what the Church swiftly got---once again in defiance of seemingly impossible political opposition---was a man whose whole life had been dedicated to the most rigorous possible reform of Head and Members: Giovanni Pietro Carafa (1476-1559), the seventy-nine year old Pope Paul IV (1555-1559). Tired of impotent roundtables discussing the need for the defense of doctrine and the reform of Christendom, this ferocious pontiff saw no need for continuing the suspended Council of Trent. He demanded immediate Unconditional Surrender from everything and everyone that he saw to be a blight on the beauty of the Bride of Christ. Ambitious absentee bishops were booted out of Rome and told to go back home. Wandering monks were sent to row galleys in the Mediterranean. Not just heretics, but also the contemporary sodomite network active in the Eternal City was handed over to the tender mercies of the Inquisition. In fact, the sodomities were sent to row alongside the renegade religious in Mare Nostrum. Most importantly for the future of the Holy See, Carafa---one of the founders of that Theatine Order which dedicated itself from the outset to a life of total indifference to the property that the “practical world” considered indispensable for “success” in all realms---made it clear that no fears of lost revenue would prevent him from driving the moneychangers from their ignoble position of dominance within the shamefully corrupted Roman Curia. Everyone filled with long seething justifiable rage rejoiced. Alas, the Holy Father was so single-minded in his warfare on behalf of a renewed sense of papal responsibility that he overestimated his immediate resources, as well as what was happening in his own trenches when he went over the top to charge the enemy lines. He plunged the Holy See into a tragic-comic war with Spain. He allowed his cardinal nephews, whom he mistakenly trusted as loyal aides, to plunder and bring shame upon the Church in their own right---at least until a holy Theatine and the future Pope St. Pius V opened his eyes to their shameful behavior (at which point he characteristically liquidated them from public life). His rigor and demand for instant and black-and-white solutions alienated everyone, bringing down the innocent along with the guilty. In the long run, it was Marcellus’ doctrinal firmness and commitment to reform, along with his nuance and charity that were needed. Thankfully, such a medley of virtues did come to the fore in the decades of the Catholic Reformation that followed. Pope Pius IV re-opened, completed, and promoted the arduous work of translating the letter and spirit of the decrees of the Council of Trent into the practical administrative machinery of the Church. Pope St. Pius V advanced that labor with the vigor and efficacy that sanctity alone could provide. All their followers on the throne of Peter then had a reinvigorated “standard operating procedure” to guide them towards still greater progress in the fight against the proponents of “total depravity and the war of all against all” and for the spread to the ends of the Earth of a Faith that both embraced but also corrected and transformed fallen nature. Still, there is no denying that the Blitzkrieg that preceded their reigns had brutally stunned the heretical, criminal, and merely lax elements in Rome and the Curia. Paul the Terrible was the first contemporary pontiff who really made it clear that this business of a defense of the Faith and a reform of Head and Members meant separating the chaff from the wheat in a way that hurt. The Romans might justifiably be infuriated with him upon his death, but, as the Venetian ambassador at the time indicated, the Eternal City had become a monastery in comparison with its former wicked self. Would the administrator and the saint have found their task as simple without the warrior pope? Would they have even been elected as opposed someone permitting the return of the vultures? In short, would there have been a Pius IV and a St. Pius V had there been no Pope Paul IV? It is precisely because every age is somewhat different that analogies are never exact. Traditionalist historians, myself among them, have repeatedly pointed out one distinction making our situation today different from and more dreadful than that of the sixteenth century. This is the fact that the Council called to face “the modern world” openly rejected the crucial example of Trent, whose model was also followed by Vatican One. Under the pressure of long-developing undercurrents ranging from old-line Jansenism to modern Personalism and Pluralism, Second Vatican Council did not choose to view the confirmation of a Catholic doctrinal substructure under serious attack as something absolutely necessary to effecting serious practical reform. It thus proved helpless in preventing heretics from running away with the definition of the meaning of the words “serious”, “pastoral”, “practical, and “pragmatic”, and then moving on to usurp the Holy Spirit for a dogmatic seal on their own arbitrary decisions. This, as we all know, has left us with a Church in which the poisons of the world in which we live---a world that has developed the consequences of the doctrine of total depravity and life as a jungle war of all against all to its final stages of madness---are administered to us as though they were the cure for all our spiritual ills. Nevertheless, mutatis mutandis, I very much think that the basic set of sixteenth century developments discussed above can be a highly effective teaching tool for coming to terms with our own era of unending crisis, sorrow, and rage. Let us imagine a believing Catholic---namely a person just slightly older than myself---passing through the fifty-one years since the beginning of the Second Vatican Council. That person, who was eighteen in 1962, would now be in his late sixties and hopefully still active in defense of the Church. He will have experienced one disappointment after another as he watched the Body of Christ engaged in her auto-destruction. He will have heard the endless lamentations---well outlined by Dr. Brian McCall in a recent article in The Remnant---regarding the “will” of the “real” Council as opposed to its horrible post-conciliar “distortion”. He will have watched that supposed distortion confirmed, year after endless year, by the droit de cité given new assaults on the Faith, as well as on Catholic moral principles, liturgy, and devotion---a droit de cité regularly granted by clergy and laity who had first railed against such further radicalization in the name of “the true Council”. His sense of betrayal, rage, and, yes, admittedly, also his desire for vengeance against those disfiguring the Bride of Christ will have grown apace. One of those Catholics---namely myself---was led by his fellow Traditionalist Michael Davies, that great defender of the Traditional Liturgy and long term President of Una Voce International, to take heart by following the actions of Cardinal Joseph Ratzinger, which seemed to offer some serious hope for the future. Davies consistently argued that Ratzinger was a man who had become very much aware of the havoc being wreaked by the doctrinal Revolution taking place within the Church and wanted to halt and reverse it through his labors at the Congregation for the Doctrine of the Faith. He was a man who appreciated the work being done for long term recovery of Catholicism by new traditional religious orders, lay action groups, and, above all else, that Vanguard of the Movement, the Society of St. Pius X. But, Davies concluded, one had to remember that Ratzinger was man working for the good in his own nuanced way, highly conscious of the complexity of getting things done in the Church at any time in her history, and much more so in a time of crisis. It was due to heeding Davies’ admonishments that my wife, children, and I fell on our knees to thank God when we heard of his election as pope. My hopes for his pontificate were stirred still further several months later when I stood in St. Peter’s Square and heard him speak at the time of the Angelus. Here was the voice of that same scholarly, good, extremely humble and unpretentious man who, in 1995, while cardinal, stopped to chat with my family outside a simple Roman trattoria in Trastevere, and then gave our three month old son his blessing. That Angelus convinced me that restraint and dignity were once again on the march, and a return to sanity along with them. Here was the pope who then, several years later, told the world openly what we Traditionalists desperately needed to hear from the voice of the Supreme Pontiff: that the Mass of the Ages could not be wiped from the face of the Earth. The Revolution was palpably being thwarted. Peter was awakening from slumber. The impossible was becoming possible. Yes, I am fully aware that my fellow Traditionalists have all too justly pointed to a role both theological and pastoral, first as Cardinal Joseph Ratzinger and then as Pope Benedict XVI, that does not seem to fit the happy picture that I am painting. Yes, there has also been so much more that I wanted him to do that he could not seem to bring himself to carry to fruition. But would that I had that one blessed achievement of giving the lie to the decades of lies of the enemies of the Traditional Liturgy! Would that I had that one honor to lead me before the judgment seat of the eternal throne of God! The motu proprio alone proved to me that the Revolution in the Church was being thwarted, that Peter was beginning to awaken from his dogmatic and pastoral slumbers, and that the false pastors knew it. But all these hopes turned to renewed sorrow on the morning of Monday, February 11th, when I awoke to hear the news of Benedict’s abdication. True, given his age, my family and I had prayed for even just one year for his pontificate to last. We got eight. But what were a mere eight years at the top of our beloved Church, tortured by over five decades of precipitous decline? My scholarly, humble, unpretentious, nuanced man was to be my leader no longer. The counterrevolution was in danger of stillbirth. By chance, I was precisely approaching the middle of the 1550’s in my lectures on Church History in New York. I felt that my “Marcellus” had been taken from me, but in a new and mysterious form---dead as pope, while still alive as an individual Catholic; dead as pope for perhaps not having focused as intently and vigorously on those matters that his career at the Congregation of the Doctrine of the Faith might have lead us to hope would have preoccupied him; dead as pontiff also, perhaps, for succumbing to what Michael Davies called “the Opiate of the Popes”---the constant and financially bankrupting preparation for, undertaking, and analysis of travels that are declared valuable chiefly by a world eager to see Benedict as the last heir of St. Peter. What is to come next? Who knows? Cardinal Ratzinger, despite the clear political and religious opposition, was as obvious a candidate for the papal throne in 2005, as was Cardinal Cervini in April, 1555. The conclave about to meet is potentially as fractious as the one assembling the month after the death of Marcellus II. All of us know that the vultures, inside and outside the Church, sense new blood coming their way with the living death of my cherished “Marcellus III”. Predictions of vast new changes, brought about by ingesting still larger quantities of the poisons provided by the “pragmatic” world around us abound in every newspaper and on every talk show. Visions of William Butler Yeats and some “rough beast slouching towards Bethlehem” dance about in my mind as I type these words. What is it that we need to hope for in our bereavement? What kind of Supreme Pontiff must we call upon the Holy Spirit to guide the cardinals in Conclave to provide us in this, the fifty-second year of the sorrow and anger of our current Catholic Winter? Allow me to answer that question with reference to a saint whose influence was enormous upon many of the great and vigorous men and women who guided the Catholic Reformation; a saint whose central spiritual theme was reiterated in the words of Louis Veuillot placed at the head of this article. That saint was Catherine of Genoa (1447-1510). This remarkable spiritual guide looked out at a Renaissance Catholic world of such widespread, intricate, materialist, vulgar corruption and indifference that seemingly nothing could cut through and correct it; a world before whose crimes those dedicated to cataloguing legal and administrative measures for effecting salutary change were throwing up their hands in despair; a world that all too understandably gave birth to a Luther who proclaimed it incapable of ever pleasing God. Let us not be timid, and ask the Holy Spirit to come down upon the cardinals in Conclave and fill them with the grace to elect an effective pontiff possessing all the virtues needed to save the Church and Christendom. And then let us ask St. Catherine of Genoa in particular to pray that the Princes of the Church do not look to the secular forces around them for definition of the kind of “practical man” and “practical virtues” needed to teach Christ and Him Crucified to “the real world”---as they, in their commitment to “sinful business as usual” disfigure it. Pray for us, St. Catherine, that they will elect someone who will use the only truly practical wisdom---that which comes through the grace of Christ; that which works with all of nature in its immense complexity and nuance; but that which understands nature’s flaws, correcting and harmonizing its various elements through grace. Pray for us that they will elect someone who, with his eyes fixed firmly above, and operating within the context of the proper hierarchy of values, then can make the administrative and legal changes of a Pius IV and the practical defense of the liturgy of a St. Pius V under much more trying circumstances than ever before. And pray, finally, St. Catherine, that the cardinals in Conclave recognize that no pope of this sort can be obtained without possession of a good deal of the rigor, energy, and desire for stable cleaning of that ferocious warrior, Paul the IV “The Terrible”---who was one of your most fervent admirers! Pray, in other words, for a mixture of Paul IV, Pius IV, and St. Pius V.
That missing, frightening element of chastisement so visible in Paul IV must reappear so that the virtues of his successors can also thrive anew. Our humble and much appreciated “new Marcellus” prepared the path for the success of this composite pope. Benedict arrived at a moment when his nuance, however unsatisfying it may have been to us in our longing for getting the job of reconstruction done swiftly, might have been more suitable, and the anger of a Paul IV and his admirers less productive. There is no doubt in my mind that Benedict-Marcellus has left us much stronger than many of us in our traditionalist impatience recognize, and for this we should be eternally grateful to him. But justifiable rage against the auto-destruction of the Church and the civilization she protects must now thunder from the See of Peter. Moreover, all of us, making the same internal break with the impractical “practical wisdom” of the world around us, must join with a “thundering pope” in transmitting his message of Faith, Reason, grace, and hope to our families, jobs, and countries. If such a pope and such an assistance do not appear, the unjustifiable rage of the enemies of the Faith, both within and without, all of them smelling blood in this moment of renewed sorrow and confusion, will move relentlessly forward in their labor of destruction of souls and society. Pray for us, St. Catherine, pray. Come Holy Ghost, come. Thank you for such an insightful and clear understanding. An excellent historical summary of those crucial decades of the 16th Century. "But justifiable rage against the auto-destruction of the Church and the civilization she protects must now thunder from the See of Peter". Yes, there HAS to be a serious display of righteous anger to shake up the forces ranged against the Restoration. May God grant us a lion! "Think, for a moment, of the life of a fervent, believing Catholic just reaching manhood in 1517. Such a man would have been in his mid sixties when the last acts of Trent were promulgated. In the interim, he would have seen an immoral, indifferent, politically obsessed, secularized, intellectually and spiritually clueless clergy and laity allow the Bride of Christ to be brutally lacerated and piteously mocked." You don't state which country you are writing about. The work of historians like Eamon Duffy, Christopher Haigh, Philip Hughes, Jack Scarisbrick and others, has demonstrated that the English Catholic Church - laity and clergy - were by no means "immoral, indifferent, politically obsessed, secularized, intellectually and spiritually clueless" in the early 16th century. Certainly it was in the interest of later Protestant propagandists to make out that they had been, but in fact Catholic England was in reasonably good condition before Henry's break with Rome - one or two exceptions like Wolsey, of course. There was quite a high general level of piety. Life revolved around the village and town churches. There were hundreds of guilds and societies. The liturgy was well celebrated. Most people left money or possessions to the churches in their wills. Remember that there were three major rebellions against the reformation changes: the Pilgrimage of Grace in the north, later the Western Rising of 1549, and finally the revolt of the north again in 1569. All were put down in blood. A popular, reasonably educated, fairly pious English Catholicism was deliberately destroyed by Tudor monarchs and a minority of Protestant zealots. The one fault of the English perhaps was too great a respect for the King's writ. Kings and Popes had fallen out before, and maybe they just hoped this storm too would blow over in a few years. But backed by the continental Reformation, it didn't. From 1517 to 1580 you see an immense shift from general religious commitment (Catholic) to widespread religious indifference under a State Church which many people did not like at all. It took a few decades for Anglicanism to "get its act together" and it never did recover the lost ground - within another 60 years the country was torn apart by Civil War. I love the reference to the Vanguard of the Movement, which it truly is. I'm not a traditionalist, and disagree with some of the things traditionalists say, but I say Amen to pretty much all of what you have written. Yes, what we now need at this time is a fearless, courageous, truly faithful orthodox Catholic Pope. A pope who will clean out the stables and steer the barque of Peter to safe harbor. Anything less will only spell disaster and destroy the Church (except for a remnant)because the world is massing its armies to war against the Church, and God. All holy saints, please pray for us and God's Church. At age 65 - having lived the unfolding events of the last half-century, how well I can identify with Dr. Rao’s 16h century Catholic! Age 15 at the beginning of Vatican II, I have experienced in frustration and tears how the aftermath of the Council (coupled with the social insanity unleashed in ‘60's) has impacted every area of my life, changing its direction entirely from what one may have expected in my happy Catholic 1950s childhood. For my Dad, a thrice wounded veteran of WWII, the aftermath of the Council was worse than the War. The Church - his rock in war and peace - was under attack by her own. He was totally spun out by our horrifying early preview of what was coming to his beloved Church - and NOBODY (priests, relatives) would listen to his warning. 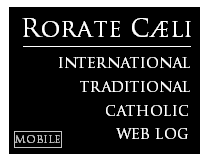 Becoming some of the world’s first ‘traditionalists’ before that tag was ever hung on us, we were “Roamin’ Catholics” who even moved to a more conservative diocese hoping to outrun the ‘changes,’ ever hopeful that someone would stop the insanity. During one 6-year period we belonged to 9 different parishes. An old priest had told my Dad in 1965, “Hang on, Charlie, the pendulum will swing back.” Forty years later I stood at my 88-year-old Dad’s deathbed, thinking that he had indeed lived to see the beginning of a real comeback for the Old Mass. Always fully aware that Rome had never abrogated the Latin Mass, Dad died without seeing its vindication in Benedict XVI’s Moto Proprio. And I? As I look back over 50 years of my life, I see a landscape littered with Post-Vatican II casualties, a time period that perhaps history will finally recognize as a time of great crisis in the Church. I am thankful - by the grace of God - that I am still a Catholic, still attending the Traditional Latin Mass and practicing the Faith it represents, as with tears I pray for the election of Christ’s next Vicar, and for the true ‘renewal’ of Holy Mother Church which He has promised never to abandon. Beautifully said, and thank you for it. For my Dad, a thrice wounded veteran of WWII, the aftermath of the Council was worse than the War. The Church - his rock in war and peace - was under attack by her own. He was totally spun out by our horrifying early preview of what was coming to his beloved Church - and NOBODY (priests, relatives) would listen to his warning. Becoming some of the world’s first ‘traditionalists’ before that tag was ever hung on us, we were “Roamin’ Catholics” who even moved to a more conservative diocese hoping to outrun the ‘changes,’ ever hopeful that someone would stop the insanity. During one 6-year period we belonged to 9 different parishes. An old priest had told my Dad in 1965, “Hang on, Charlie, the pendelum will swing back.” Forty years later I stood at my 88-year-old Dad’s deathbed, thinking that he had indeed lived to see the beginning of a real comeback for the Old Mass. Always fully aware that Rome had never abrogated the Latin Mass, Dad died without seeing its vindication in Benedict XVI’s Moto Proprio. A wonderful post and thank you so much for it. My father is 82 now, my mother 84. For your dad - read them, and so many, many others. My father tried a few years ago to become reconciled to the Novus Ordo but simply couldn't do it. He's back with the SSPX now, the true heroes, along with the traditionalist laity, of this age. May God bless you and reward you richly for your continued faith. As Russia has crept into this thread, a country in which I lived for thirteen years, and inspired by Mary E.s post, I would you like to share with the readers the story of Margarite. It is the Winter of 1941. The German armies threaten Moscow. The cold is the worst for many decades. In the centre of Moscow, just a stone’s throw from the Kremlin and its surrounding streets is a prison, whcih also serves as the headquarters (it remains so to this day) of one of the most evil organisations in the world’s history. The prison is the Lubyanka, and the organisation is the NKVD. In one of its underground cells is a girl, a student. Her name is Margarite. Not the usual Russian “Margarita” but “Margarite”. She is the daughter of a Russian father and a Polish mother. She has been arrested for becoming a Catholic. Her story is simply told. A clever student, she had started that fateful academic year at MGU (Moscow State University) in the Faculty of Foreign Languages. One day, she was walking past the Catholic Church of St. Louis (given for their worship to the Catholic diplomats to the Tsarist Court by Catherine II in 1799) which, as it happens, is situated just 200 or 300 metres from the Lubyanka). It is the only Catholic Church allowed in Russia by the Soviets. On an impulse truly from God, this girl, brought up all her life as an atheist, walks into the Church and tells the one priest allowed by the Communists that she wishes to become a Catholic. Greatly suspicious of a KGB provocation, he says “no”, but she comes back and eventually he is persuaded of her sincerity and he baptises her. That night, she tells her best friend in the University dormitory that she has been baptised and the next day she is arrested. Her best friend has betrayed her to the KGB. She receives eight years in the Camps. It is now 2008, the Summer. I receive a call from Father Ryan asking me to assist him at the burial of old Margarite. I know a little of her story, but none of the details. I had met her at Father Ryan’s English Mass in the crypt of the Catholic Cathedral in Moscow several times (a decrepit and nearly blind old lady, always with her devoted friend Svetlana). On one occasion she looked me in the eyes and held my gaze, seeming to search my soul (I felt that I failed the test). I knew this was a special lady. Her eyes were deep pools of memory and suffering. On the appointed day, Father and I met at her home. A small Soviet flat. Poorly furnished with the usual Soviet furniture (but scrupulously clean); a few photographs and many books. There are few people there in all, about four or five. Propped up on two old wooden chairs is the coffin, which is open: Margarite is visible and her skin is already blotched with red and black. Father and I sing the “Salve Regina” and Father says a few impromptu prayers. The hearse (a rickety old minibus) arrives and the workers ask us to leave the flat: to get the coffin out and down the stairs, they have to take Margarite’s body out of the coffin and put it back in once they have manoeuvred it onto the narrow stairwell. They don’t want us to see them do it. We board the bus and are stuck in traffic for an hour and a half before we reach the cemetery. Once we find the plot, we have to break and pull out some of the overgrown weeds which obstruct any view of the grave that has been dug. Father blesses the grave with Holy Water and I light the incense in the thurible. We sing some hymns, Father says a short version of the burial service, and that is that. I feel very tearful. So was laid to rest Margarite, a soul who suffered in Stalin’s Camps for her Catholic Faith, which she kept until the day she died. The fall of the satanic cult of Communism was of course a happy day for her. Even more, the restoration of the Church in Russia was a day of great joy. She made herself known to the first Catholic Bishop and was asked to help translate the Novus Ordo into Russian, which she did. She attended Mass every Sunday, whenever her ailments allowed. She and Father Ryan came to know each other and were very fond of each other. It was a very great honour for me to know this martyr for the Faith, a great honour. Someone who put a human face on all those books I had read about the GuLAG by Solzhenitsyn, Shalamov and Marchenko. Someone who had known suffering, true suffering, but who lived her entire life lsince her 1941 baptism loving and trusting Our Lord. May God forgive her her sins, take her into His arms and grant her eternal rest and peace! Of your charity, please pray for the soul of a true Catholic, a Russian lady called Margarite. Thank you Dr. John C. Rao, a very timely article indeed, I really enjoyed it and thank you Rorate Caeli for publishing it. Mary E., thank you. This testimony of yours needs to be published far and wide. "For my Dad, a thrice wounded veteran of WWII, the aftermath of the Council was worse than the War." Meditate on that, friends. A tree is indeed known by its fruit. In light of Benedict Carter’s inspiring story, may I relate another - the point being of souls keeping faith and hope for long years whether under Communism persecution in the East or Modernist persecution in the West. During 10 of these past 50 years my family found a haven and peaceful Mass attendance at a Ukrainian Catholic Parish (Eastern Rite - Uniate - recognized by Rome). All the elderly and middle aged parishioners were refugees to the U.S. from the Ukraine. Among them was “Grandma C.” and her maiden daughter whom we will call Maria. One day we took them home after Mass to their humble two-room apartment where they served us warm pop while Maria told us their story in broken English with many nods of verification by Grandma as the story progressed. In the Ukraine, during WWII Maria had gone to a nearby city to work, but when she went home to her widowed mother at the end of the war they found themselves under Communist rule. In the confusion at the end of the War her brother had managed to escape to the West, but Maria and her mother were stuck. The authorities would gladly let the old mother emigrate, for she was past the age of a productive worker, but Maria was young and strong - no way would they let her go. The brother in Canada, and later in the U.S., was working from this end so that his mother and sister would be allowed into the country if they could ever get out of the Ukraine. Every week I could see Grandma C. In the front pew in her winter coat and babuschka scarf, her children and grandchildren around her, devoutly attending Mass in freedom - a living example of hope. “Pray, pray, pray, God is good! Back to my more mainstream self, I think Cardinal De Paolis has the potential to be the one that is needed, per this article. god help our church in this time of crisis!dr.john rao is a great writer and a good catholic.let us pray for the pope of today-benedict-and pray for the new pope to be.hammer of the heretics -no less.philip johnson. I came into the Church at 24, the year Benedict was elevated to the papacy. The Revolution passed me by for most of my adult life. I'm one of the laborers called into the vineyard near the end of the day. Just reading about what went on in every parish in every diocese in the world during the 1970's and 1980's makes my blood boil. I can't even conceive how it must have felt for faithful Catholics to live through it. I guess that's why I'm always more confused than anything when I hear Catholics go on about how mean and angry and bitter Traditionalists are. I think, "Heresy, sacrelige, and immorality do indeed make me angry sir. What makes you angry?" A great article. From it, I conclude: ab esse ad posse valet consequentia. The Church has seen worse and made it through. If we believe, as BXVI does, that God would not revoke His covenential promise to the Jews, then it stands to reason that He will not allow His Church to fall prey to those who would bring it to ruin. A good comment from F Marsden. The 16th century doesn't quite exactly fit Rao's purposes. The essay itself is mostly good, but still subtly partakes of an increasingly common dodge used by Catholic writers. These writers acknowledge the desert which followed Vatican II, and even describe it in brutal clarity, but neatly elide the inconvenient role of the Church in it, the "auto" component of the "auto-demolition" of the Church which so differentiates the 20th century from other crises like the 16th or 11th. Hello all. Well, Ben, I can see why you told me to come to this site. What a wonderful article and some wonderful posts following. I don't have anything comparable to write...I just feel useless and helpless from confusion. I have my own story...but it's not the story of a faithful Catholic. My story started in an atheist family in the 60s, I was born around the time of the council and knew nothing. At about age 8 I wandered into a Catholic Church and felt something, although I didn't know what it was. I can still see that Church in my mind and remember how it felt. But I didn't listen to the calling and wandered away...although I never forgot. Life in the 70s led me astray along with many people, and the atheist background didn't help....I had no guidelines to hold on to. In my early 20s I married into the Islam which was a huge relief at the time...at least it gave me some framework. It took a long time, 2 marriages, 2 divorces, (allowed in the Islam) and a nagging undercurrent of still feeling drawn to the Church. Finally, alone with my 4 children and a "desert of destroyed love" I began a process of trying to make sense of it all. I started from scratch and spent my time reading in comparative religion...until eventually mind met heart and I went home to where it had all started...the Catholic Church...I will never forget that first Easter morning Mass...it made me cry, it felt like home and I couldn't understand why I hadn't come here before. Life outside the Church is a confused, incoherent mess. I feel like how is anyone supposed to even play, let alone win, if they don't know the rules of the game. And me, in my time, I was the thin end of the wedge...look at it now, how it has spread. But slowly I began to notice "anomalies"....strange things in my beloved Church that didn't seem quite right. Like coming home after a long time away but finding things not quite the way you thought they were. And then I began to understand what had happened. All my life, in moments of distress, I cried out "I want to go home" although I didn't know what I meant by that, or where was home. And then I found my home, where I should have been all along if I had listened to my heart. And in spite of a few misgivings about things not being quite the way I thought, I was happy, because Pope Benedict was "redecorating" my home. Now he will leave and the job's not finished. And like someone else commented on another thread, that night when I heard the news I cried...my Pope, why are you abandoning us? I try to stay calm and trust in what the Holy Spirit will provide for us...but I am afraid...and torn...my Church, my Pope...or the traditions of the ages. I keep trying to balance the two. 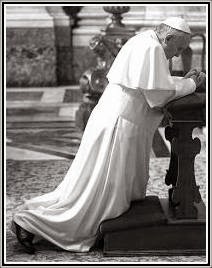 I would like to ask you to pray for me....but no...use all your prayers for a good Pope who will make things right...so that home can really be home. A very insightful article about how the Church was dead and buried, but like Her Spouse, rose again. Maybe we should ask ourselves "Why do you seek the living among the dead?" Christ said the gates of Hell shall not prevail against the Church. Not only is there reson to believe that this is the turning point of the modern Church (another "Counter Reformation"), but that a mass conversion is on the way, somewhere in the world. During the upheaval of the Reformation, millions of people rejected the Church and became openly hostile to all that was Catholic. But, lo and behold, in 1531 Our Lady appeared to Juan Diego and the image of Guadalupe converted more, if not twice as many more, people to the Catholic Church. "I will not leave you orphans" said the Lord. Let's hope and pray for another St. Pius V or Bl. Pius IX, while not forgetting that Pius IX was elected as a notorious liberal. Dear God, that the galleys may return!!! As Monsignor Gilbey emphasized so often: Our first order of business is not to 'save the world' but to establish the Kingdom of God Within. This is never 'problematical' nor dependent on any conclave. It is really what we can 'do' as Catholics. Thank you Dr. for this very helpful article. I join in your prayer to The Holy Spirit and St. Catherine.